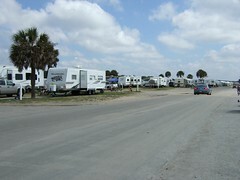 Lakewood Camping Resort is like its own little city. They have everything you could possibly need while on vacation – stores, restaurants, coffee shop, mail service, laundromat, and tons of fun things to do – pools, slides, sports, mini golf, boating, and, of course, the beach. 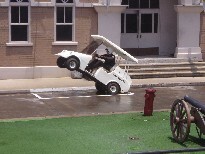 Once inside, you can get around by walking or riding a bicycle, but most people opt to rent a golf cart. It makes lugging coolers and chairs to the beach much easier. Plus, driving a golf cart around for a week is just plain fun. We rented one for the week. The golf carts are electric, so they don’t go too fast, and the campground has the necessary rules governing the use of them, so overall, even though there are hundreds of them driving around, it’s pretty safe. I guess that’s why I didn’t consider the possibility of someone getting hurt. I should have learned my lesson when we went last year, and Ronnie managed to back into my shins not once, but twice. I’m surprised my bruised shins didn’t make more of an impression on me, but this year, I had forgotten about accidents, and I wasn’t careful at all. 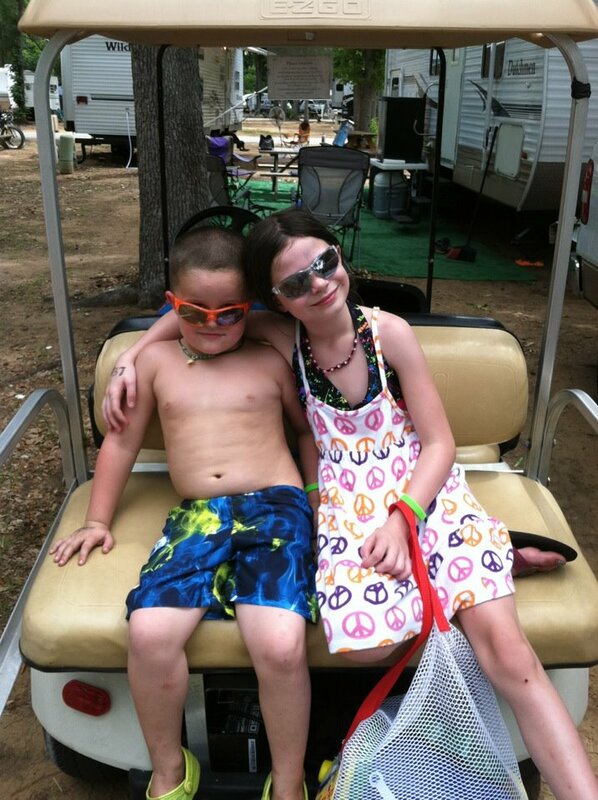 Max and Kendra on the golf cart waiting to ride from our campsite to the beach. Max and Kendra were sitting on the back seat, and I backed the golf cart out of our campsite. I halfway noticed as I looked over my shoulder to back up that Max was lying down instead of sitting properly, so I told him to straighten up. I didn’t, however, wait for him to sit up as I instructed, and when I put the golf cart from reverse to forward, I threw him off. He screamed and rolled on the pavement. I jumped off and ran to him, looking around to see who all had noticed what a bad mom I was that morning. I checked him out, and he seemed okay, but he wouldn’t stop wailing – I think he was more mad at me than anything else. He was making the most of this opportunity to get back at me for throwing him off. He really made quite the scene, so I told him to go back in the camper. Even though I was embarrassed and mad at myself, when it finally sank in that I had thrown my five-year-old son off a moving vehicle onto hot asphalt while he was wearing only swimming trunks, I started feeling really, really bad. I couldn’t shake it off. I apologized to him so many times. I asked him if he was mad. I begged him to forgive me. I told him it was an accident. I just couldn’t shake it off all day long. Finally, that evening, all four of us decided to go for a golf cart ride around the campground. Max joked a few times as we drove around and told random people how his mom threw him off the golf cart. Funny boy. We were laughing and having a great time, really making up for my earlier incident of bad parenting. We even played some music and sang together. It was really fun. This is probably the most fun we’ve had in a long time! I was on a team with three close friends of mine, and Ronnie had a team with three of his buddies. We had a perfect day for being outside running through mud. What a great time! 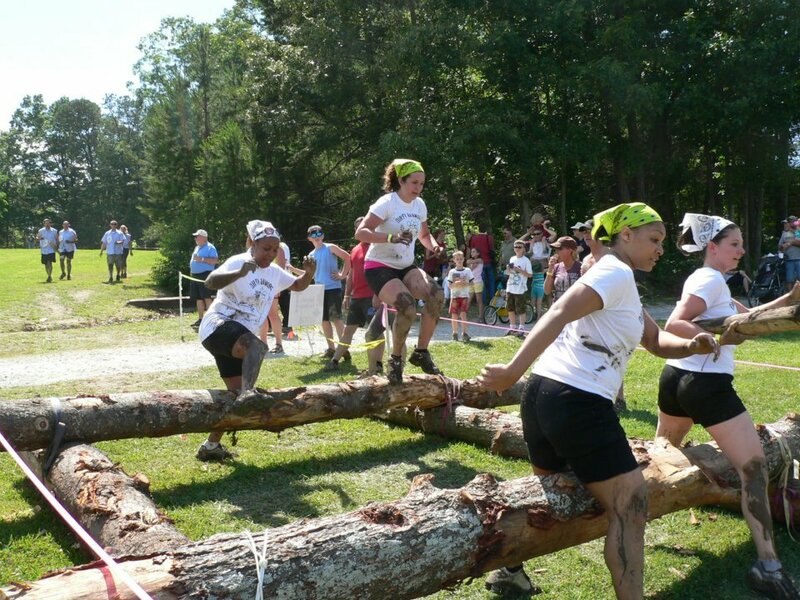 The biggest surprise was that each team had to carry a log with them throughout the race. We took turns lugging that stupid log around – it got heavy fast! We laughed a lot. Some of us cussed a lot. We ran. We walked. 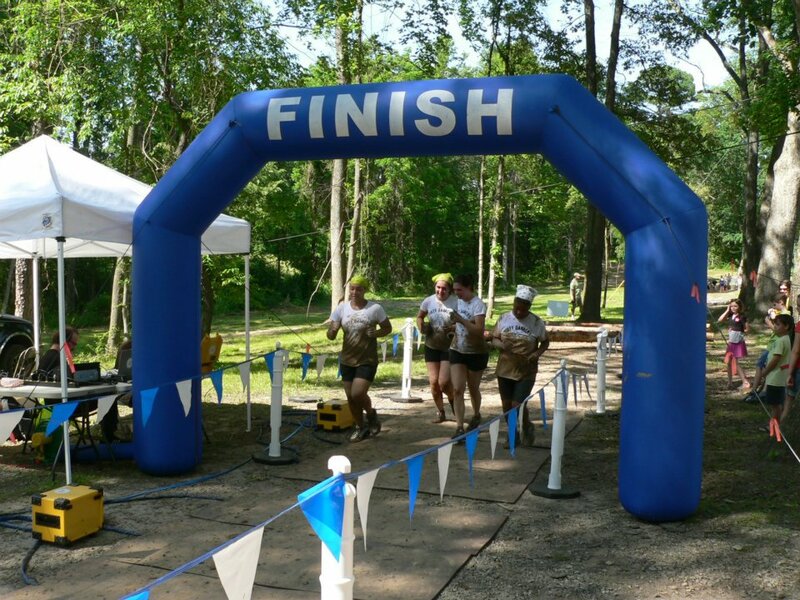 We climbed, crawled, waded, swam, jumped, slid, and rolled our way to the finish line. The volunteers manning each obstacle were very encouraging. We’ve all decided to run next year. But this time, I think we’ll train a little beforehand. What a great time with great friends! 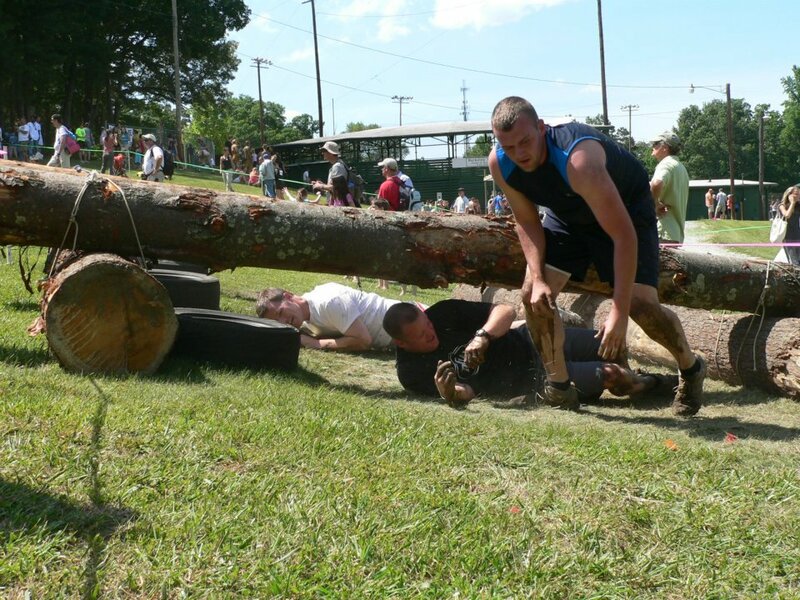 Today is a big day – today is the first ever Hendersonville Mad Mountain Mud Run to benefit Hands On!, a local (awesome) children’s museum. Ronnie and I are both participating (on separate teams! ), and our start time is a few hours away. It should be a lot of fun. 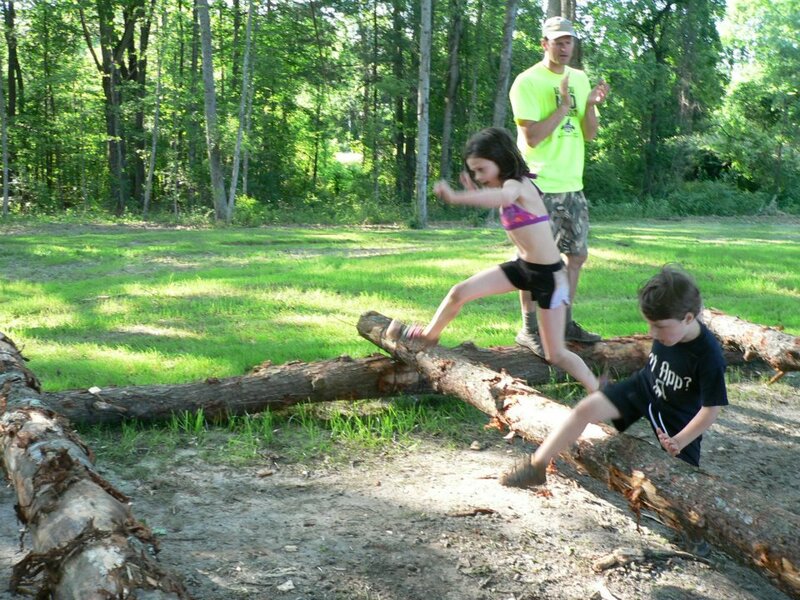 Last night was the Mad Mountain Family Mud Fun, the family event that included a mini-mud run for the kids. I registered all of us so we could run with Max and Kendra. I was thinking that Max would probably need some help along the way; after all, he’s a little fella and the course was a mile long with challenging obstacles, not to mention the crowd of older kids that were running as well. Before the race started, we talked to him and assured him that we would stay with him. We gave him a pep talk so he wouldn’t be nervous or confused. The organizers separated the kids into age groups, and the idea was to let the older kids go first so they wouldn’t run over the smaller kids (the recommended age for race participants was between 7 and 11). At the last minute, I told Max that we would let the big crowd go ahead of us, and then we would go. He was in the middle of the pack of big kids, and Ronnie, Kendra, her friend, and I were way behind. I thought he would slow down, but he didn’t. Something just came over him. He must have experienced an adrenalin rush that propelled him forward at the speed of a ten-year-old. He was flying! And we couldn’t catch up! 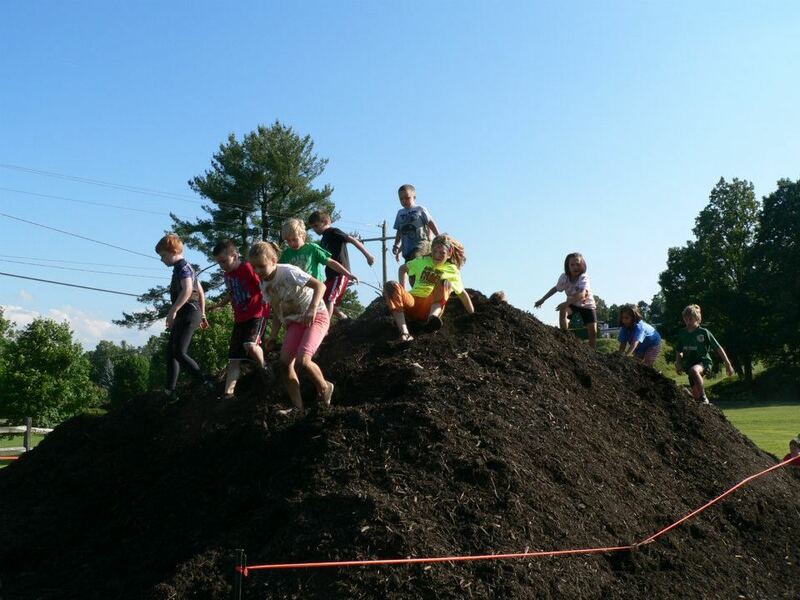 He crawled through the first mud pit, climbed over the giant mulch hill, and I finally caught him as he got to the pyramid of bales of hay we were supposed to go over. Any time he slowed down, I told him Kendra and her friend were right behind him about to catch up, and he would take a deep breath, ball his fists, lower his head, and kick it up a notch like a little freight train. He finally got tired at the very end, and Ronnie carried him for about thirty feet until Max caught sight of the finish line. Then he wanted down and he hit the ground running. He went over the final logs, over the final hay, and sprinted to the finish line. When Max heard that and looked at his belly to verify that he himself was “blue shirt,” he really ran. When he reached the finish line and ran through the tape, it was one of the proudest moments of his life. He was convinced that he won because he got to run through the tape (no reason to tell him that they were holding tape across the finish line for each kid). It was a great night. 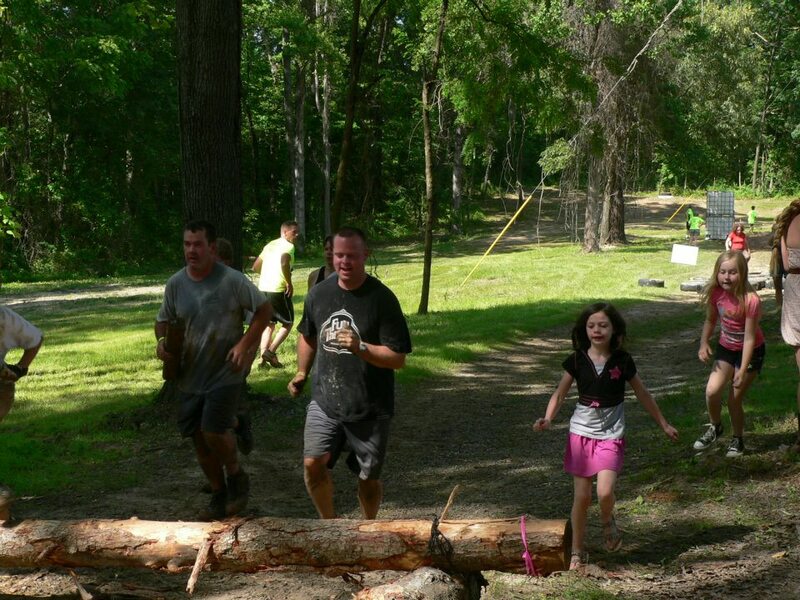 From the mud swimming, clay sculptures, Chick-fil-A dinner, tug-of-war, to the live music and enthusiastic volunteers running the event, it was one of the best family events we have ever attended. 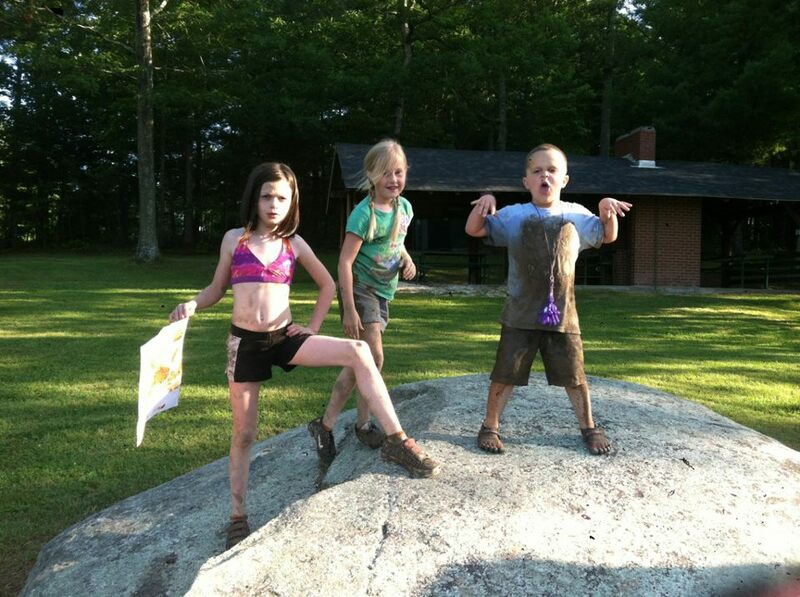 And, boy, were the kids muddy! I wonder if Ronnie and I will look like that after our run this afternoon!